The sound of bagpipes and drums will ring out across Western Sydney next year, with the NSW Government securing The Royal Edinburgh Military Tattoo in an Australian exclusive. 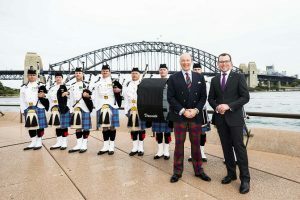 Minister for Tourism and Major Events Adam Marshall was today joined by Minister for Veterans Affairs David Elliott, Brigadier David Allfrey and a chorus of bagpipers to announce that the famous Tattoo will take place next October at ANZ Stadium. Mr Marshall said the Royal Edinburgh Military Tattoo is a global phenomenon viewed annually by a television audience of more than 100 million people that promises to provide a major boost to the NSW economy. 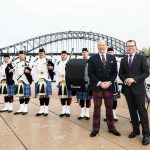 “The Royal Edinburgh Military Tattoo has only toured outside of Scotland a handful of times, so I am delighted the NSW Government has secured this international visit exclusively for our Harbour City,” Mr Marshall said. “The Royal Edinburgh Military Tattoo has a proud history of delivering world-class, public military events which entertain and inspire people all over the world. “This event is expected to attract more than 59,000 overnight visitors delivering $37 million in visitor expenditure,” Mr Marshall said. Mr Elliott said it was a unique opportunity for Australians to experience the iconic military performance. “I encourage everyone to plan a trip to Sydney next year to see this truly incredible event and support our own Australian military and Police bands, which will be part of the show,” Mr Elliott said. The Royal Edinburgh Military Tattoo involves 1,200 performers from Scotland and around the world in a performance that includes a mix of music, ceremony, military tradition, theatre and dance set against the backdrop of Edinburgh Castle. The ticket waitlist is now open at www.edinburghtattoosydney.com.au and will be on-sale from April 2019.